Phil Taylor interview’s Mick Lowe on The Insatiable Maw, Vol. 2 of The Nickel Range Trilogy. 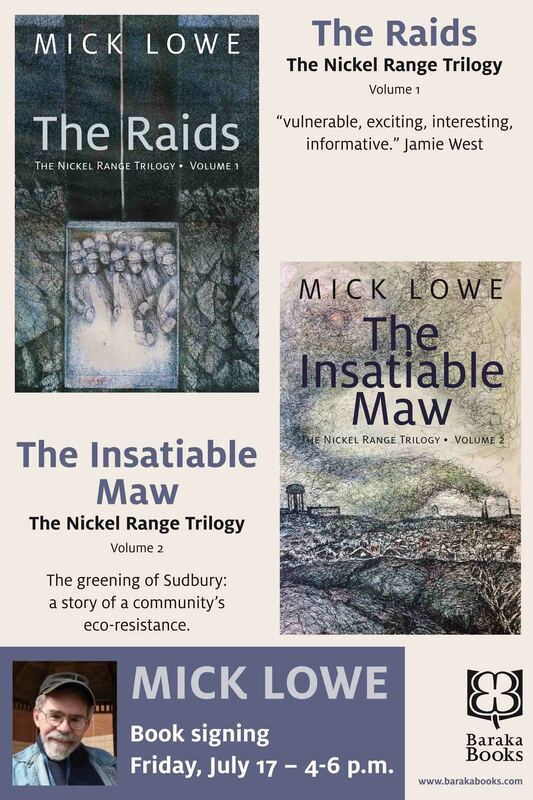 In the interview, Mick Lowe explains the title, The Insatiable Maw: He borrowed it from the late lawyer, politician, man about town, Elmer Sopha, who referred to the miners’ singular purpose being to feed the insatiable maw of the copper cliffs smelter. 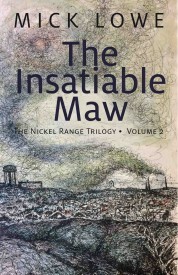 The Insatiable Maw is set in the Cooper Cliff smelter complex. 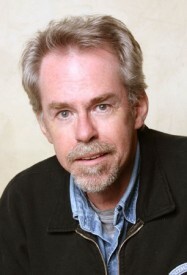 The protagonist, Jake McCool, fights for health and safety in the mines. The third volume of The Nickel Range Trilogy will be longer and will depict the titanic battle between labor and capital during the 1978-79 strike. Lowe emphasizes we must tell the story of labor struggles so the struggles and the labor heroes are not lost in the past. Click Here to listen to the interview. And buy it here. 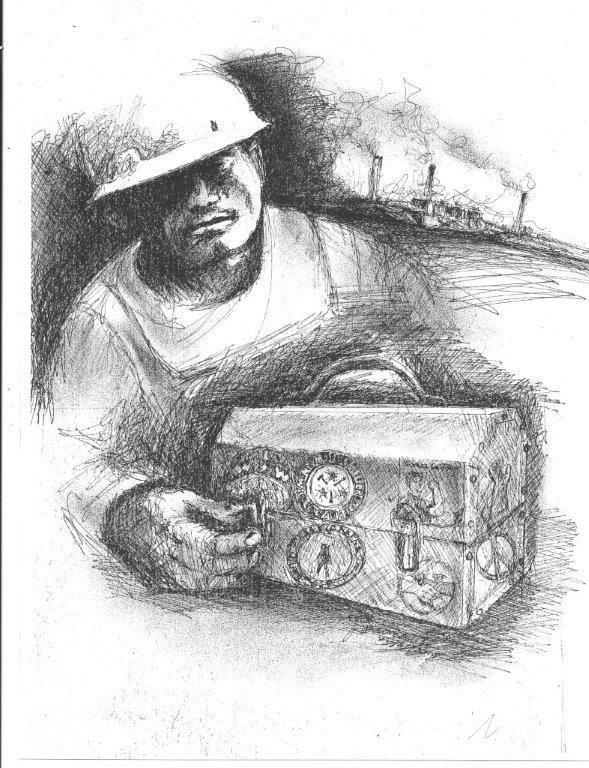 “I aim to do for nickel what Zola did for coal.” Those words – my own words – expressed the edgy, cocky aspirations of a 26-year-old newly arrived in Sudbury, Ontario, exactly 40 years ago. They have remained my mantra ever since. 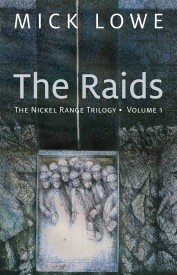 Now, as a stroke-crippled old man of 66, I am on the verge of realizing at least part of that lofty youthful ambition with the rollout of my first novel, The Raids, volume one of the Nickel Range Trilogy. I have spent the intervening years writing – non-fiction, mainly – about the Nickel Belt in a variety of guises: long-time freelance correspondent for The Globe and Mail, columnist for a small, Sudbury-based community tabloid, even a journalism teacher at the local college, all of which provided surprisingly useful training for a fiction writer. But nothing proved as useful as the aforementioned garden-variety ischemic stroke that nearly took my life on the morning of Friday, May 1, 2008, and left me a hemiplegic – more or less completely paralyzed on my left side. The transition from journalism to fiction was enabled by the disability that has left me confined to a wheelchair and to life in a nursing home for the past several years. My first attempt at turning Sudbury history into fiction – a novel based on the years that pioneering Canadian newspaperwoman Kathleen Blake Watkins “Kit” Coleman spent in nearby Copper Cliff at the turn of the 20th century – was admittedly a failure. The thing was stillborn. The reason, in hindsight: I was doing the only thing I knew how to do, which was to craft something that could be better described as “narrative non-fiction.” I had done this in the case of my first book, Conspiracy of Brothers: A True Story of Bikers, Murder and the Law. My health breakdown helped me to understand something I probably should have recognized sooner: the technique that works in one genre (thoroughgoing research and meticulous detail in the case of Conspiracy) does not in any way ensure success in another. In the case of my failed attempt at a novel, that was all I knew how to do, and it proved fatal. Decades of slavish devotion to reporting the facts had wrong-footed me when it came to writing fiction. The stroke perversely helped, because I was physically unable to visit the archives, to look things up. Instead, isolated, alone, and immobile in my nursing home Lay-Z-Boy, I was forced to rely on my imagination – to make things up. I soon realized this worked; my decades of mining the facts in the Sudbury Basin combined with my imagination had equipped me to visualize the recreation of actual, historical events that occurred years before my arrival in Sudbury. The answer is a simple one. Like most writers of historical fiction, I have tried to respect known historical events by avoiding anachronism and resisting the temptation to rewrite history. But The Raids is based on an actual event that is already, like so much Canadian history, on the verge of being forgotten, succumbing to what I call this country’s wilful amnesia. 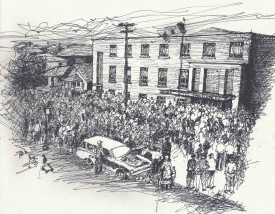 At its core The Raids contains a key premise that, while still very much in vogue here in the Nickel Belt, will prove shocking to many: owing to Sudbury’s essential strategic nature (the U.S. has no nickel deposits of its own), the Central Intelligence Agency conducted a clandestine psychological operation that created a virtual civil war in these streets at the height of the Cold War. Only fiction would allow me to posit such a premise. The CIA’s operating cloak of “plausible deniability” remains intact, and no concrete proof of this assertion has ever been found, at least not yet. In this Golden Age of the whistleblower and WikiLeaks, of the Internet and Edward Snowden, I believe proof will emerge that the U.S. secretly destabilized a community in the heartland of its closest ally. In the meantime, I have hewed closely to the doctrine of verisimilitude as my fictional standard, striving to recreate characters, settings, and plot points that are as realistic as possible. Whether, in the end, The Raids and the remainder of its trilogy will be allowed admission to the same literary pantheon as Germinal, Émile Zola’s great naturalist work of the French coalfields, I confess I very much doubt. Whether our work outlives us, whether we are towering literary figures or lowly, scuffling Sudbury scribblers, we are all members of the late Margaret Laurence’s great Canadian authorial tribe. We are all tellers of our nation’s stories and, in the end, that is all that really matters. 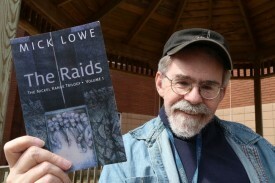 Mick Lowe’s first novel, The Raids, is published by Baraka Books. Here’s Mick talking about The Raids. 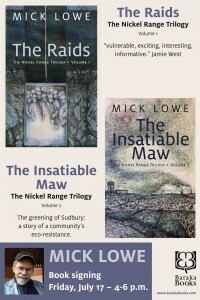 Mick Lowe will launch The Raids on Sunday, May 25 at 2 p.m. at the Steelworkers Hall in Sudbury. He will be available for book signings at the official launch. USWA 6500, 66 Brady Street, Sudbury. Buy The Raids now. 20% early order discount until May 1.